Here are three things we know about Dean Hart: (1) He’s running for New York State Assembly in Long Island, (2) he really, really loves Billy Joel and (3) he thinks his opponent doesn’t love the music legend quite enough. The Oyster Bay resident said in a press release Thursday that he would spend $1 million to build a marble statue of Joel outside the Nassau Veterans Memorial Coliseum in Long Island to commemorate the piano man’s awesomeness. The coliseum is scheduled to re-open next April with a performance by Joel, who is a Long Island native. Hart isn’t just celebrating Joel, however. 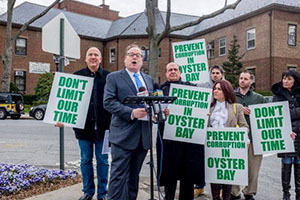 He’s also slighting his opponent, Republican incumbent Michael Montesano, who has unsuccessfully attempted to name a state route in Oyster Bay “Billy Joel Boulevard” for years. But the issue in Montesano’s case isn’t Montesano. It’s Hart’s fellow Democrats, who have reportedly stonewalled the proposal, as Montesano has made clear, according to Politico. Hart’s release can be found below. But the larger takeaway here is that this is the most Long Island story of all time.